Trophic cascade is an ecological phenomenon triggered by the addition or removal of top predators and involves reciprocal changes in the relative populations of predator and prey through a food chain. Top-down trophic cascades are initiated from top predators through herbivores to plants, and even microbes. Spatial variation in the strength of the trophic cascade has been reported over the past few decades. However, the variation in trophic cascade strength and the corresponding shift in predator and prey population dynamics and behavior are rarely tested empirically. 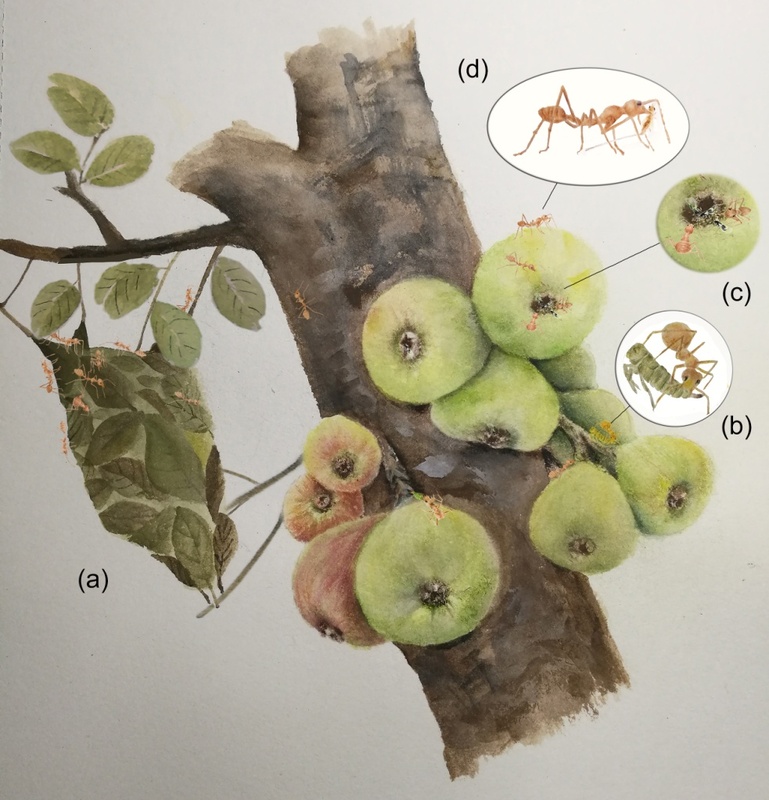 Researchers from Xishuangbanna Tropical Botanical Garden (XTBG) have previously documented a top-down trophic cascade for the effects of weaver ants on the success of fig tree seed production. In a new study published in Oikos, they tried to seek whether there is temporal variation in trophic cascade strength in the ant-wasp-fig system. They further explored what the possible mechanisms affecting trophic cascade strength are in the system. The researchers conducted across-season field exclusion experiments using a paired design to reveal the seasonal variation in fig wasp community composition between treatments (two levels: with predacious weaver ants and ant exclusion). They then used the log response ratio as a measure of strength of trophic cascade and compared these responses among cool–dry, hot–dry and rainy (hot–wet) seasons in Xishuangbanna, southwest China. They also recorded the daily behavioral dynamics of ants and fig wasps in different seasons and analyzed the correlation between behavioral, activity and trophic cascade strength. Their results showed that both fig wasp community structure and trophic cascade strength varied across seasons. Pollinating fig wasps play a central role in the organization of arthropod communities in fig trees, an absence of pollinating fig wasps results in the disassembly of the interacting community during the cool-dry season. In the hot-dry and rainy season, changes in trophic cascade strength are concordant with predator-prey interaction strength. As a reaction to environmental change, predatory ants would shift their food source from fig wasps to ground living arthropods, and figs will not be capable of finishing development as the results of pollinator scarcity, gall-making non-pollinating fig wasps also die if the fig cannot continue developing and provide food source. “The key novelty of our research lies in the observation that the strength of the trophic cascade is triggered by a top-down process, however, occurrence of the trophic cascade is determined by a keystone species that plays a central role in assembly of the community.”, said Dr. WANG Bo, the first author of the study. A schematic diagram of the interaction network among weaver ants, treehoppers, fig wasps, and Ficus racemosa. Weaver ants build nests using leaves of Ficus racemosa (a). Chemical camouflage helps maintain the mutually beneficial interaction between weaver ants and treehoppers (b), and ants facilitate the reproductive success of both sides of fig tree and pollinator mutualists by mainly preying on the non-pollinating fig wasps (d), although they also prey on pollinating fig wasps (c), and reduce their opportunities for oviposition.